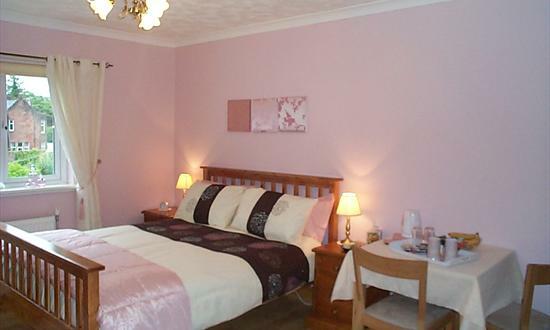 Cloudside Bed and Breakfast near Loch Lomond is close to the town centre of Alexandria and offers each and every guest a warm and friendly Scottish welcome. 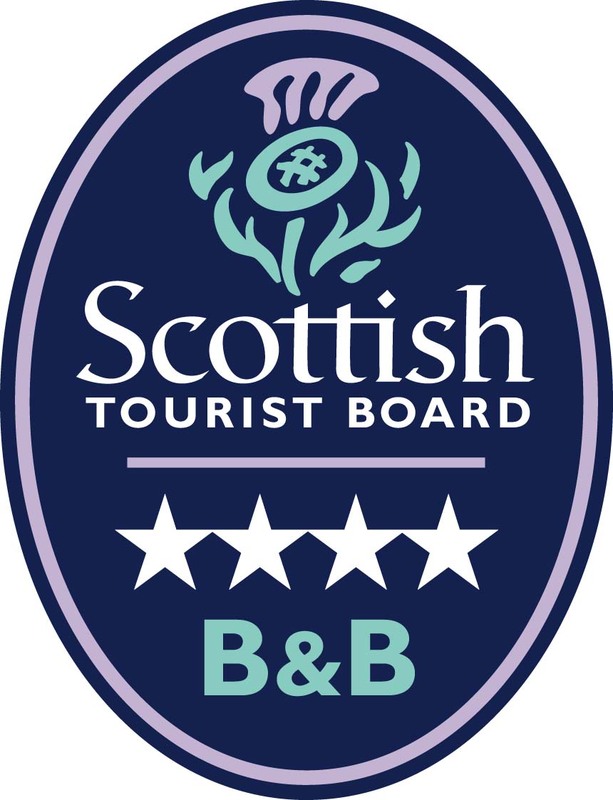 This VisitScotland Four Star Bed and Breakfast is ideally located for a visit to Loch Lomond National Park and all of the attractions and history therein. 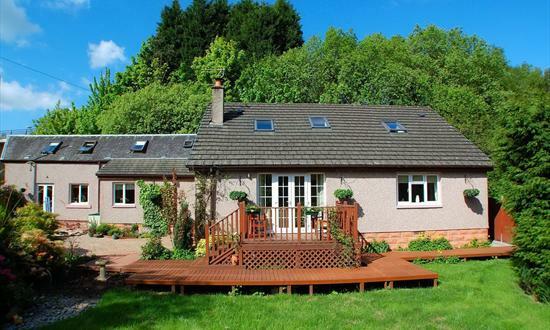 The accommodation is set in quiet leafy surroundings within an enclosed garden, less than a five minute walk to Alexandria town centre, 30 minutes drive to Glasgow airport and less than a mile and a half from the shores of Loch Lomond, the National Park and Balloch Country Park. 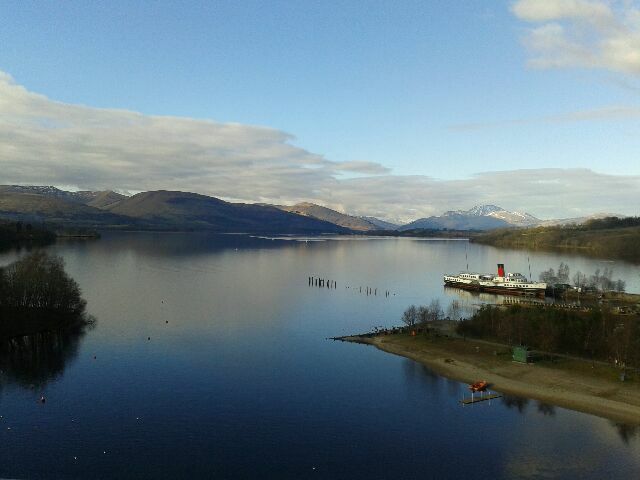 Outdoor activities include cycling, walking, golf, fishing, sailing, or perhaps some shopping in nearby Lomond Shores, Antartex Village and Lomond Gallaries. We want you to feel welcome and comfortable should you chose to stay at Cloudside all three of our rooms are ground floor, spacious and newly refurbished to a very high standard with en-suite facilities or private bathroom. Tea & coffee making facilities are provided along with hairdryers, colour TV with Dvd players and wireless internet access. Children are welcome and a cot or highchair is available on request, we also have free and secure parking for our guests. Our guest lounge offers a cosy log fire in the winter or just a relaxing area to read or chat with access to the decking & garden in the summer. Breakfast is served in the dinning room between the hours of 07:30 and 09:30 a full cooked breakfast is included or continental if preferred. Earlier continental breakfasts can be prearranged. 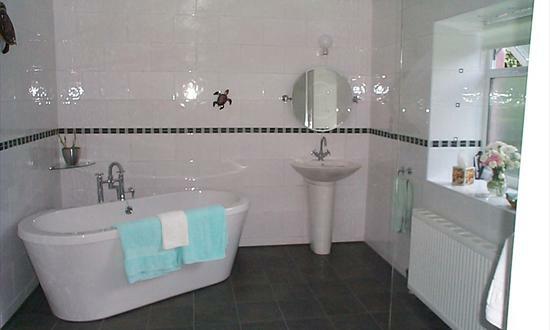 Contact the Cloudside B&B using our contact form. 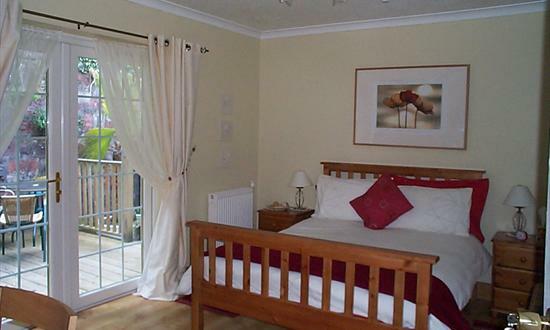 Cloudside Bed and Breakfast is committed to ensuring that your privacy is protected. Should we ask you to provide certain information by which you can be identified when using this website, then you can be assured that it will only be used in accordance with this privacy statement. Cloudside Bed and Breakfast may change this policy from time to time by updating this page. You should check this page from time to time to ensure that you are happy with any changes. This policy is effective from January 1st, 2015. Your use of the Cloudside Bed and Breakfast Web Site is subject to these terms and by using the Site you show your agreement to such terms. If you do not accept our terms, please do not use the Web Site. This Web Site belongs to Cloudside Bed and Breakfast. The images, logos and names on this Web Site which identify Cloudside Bed and Breakfast or third parties and their products and services are proprietary marks of Cloudside Bed and Breakfast and/or the relevant third parties. Nothing contained in this Web Site shall be deemed to confer on any person any license or right on the part of Cloudside Bed and Breakfast or any third party with respect to any such image, logo or name. Cloudside Bed and Breakfast reserves the right, at any time and without prior notice, to remove or cease to supply any product or service contained on this Web Site. In the event that such removal takes place we shall not be liable to you in any way whatsoever for such removal. Telephone calls using the telephone numbers provided on this Web Site and email correspondence with Cloudside Bed and Breakfast at the email addresses accessible through, or discernible from, this Web Site may be recorded or monitored. By using such communication methods you are consenting to the recording or monitoring of the same. This Web Site is for non-commercial, personal use only. The services contained on this Web Site may be supplied on a commercial basis on payment to Cloudside Bed and Breakfast or its service or product suppliers of its charges from time to time. Please contact us. 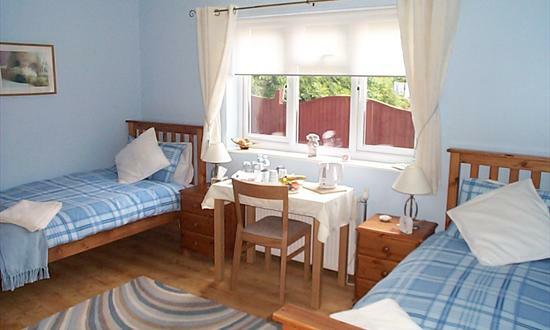 In the event that you use any of the services contained on this Web Site for commercial use, Cloudside Bed and Breakfast shall be entitled to charge you at its applicable rates in respect of such commercial use. the products and technology or processes described in this Web Site may be subject to other intellectual property rights reserved by Cloudside Bed and Breakfast or by other third parties with no license granted in respect of those intellectual property rights); images on this Web Site are protected by copyright as its text by IPR and may not be reproduced or appropriated in any manner without the written permission of their respective owner(s). Whilst Cloudside Bed and Breakfast has taken due care and attention in the preparation of the contents of this Web Site, this Web Site and the information, names, images, pictures, logos, icons regarding or relating to Cloudside Bed and Breakfast or our products and services marketed on the site (or to third party products and services), are provided on an 'as is' basis without any representation or endorsement being made and without any warranty of any kind, whether express or implied, including but not limited to, any implied warranties of satisfactory quality, fitness for a particular purpose, non-infringement, compatibility, security and accuracy. To the extent permitted by law, all such terms and warranties are hereby excluded. In no event will Cloudside Bed and Breakfast be liable, whether in contract or tort (including negligence or breach of statutory duty) or otherwise for any losses sustained and arising out of or in connection with use of this Web Site including, without limitation, loss of profits, loss of data or loss of goodwill (in all these cases whether direct or indirect) nor any indirect, economic, consequential or special loss. Cloudside Bed and Breakfast does not represent that the information contained in this Web Site is accurate, comprehensive, verified or complete, and shall accept no liability for the accuracy or completeness of the information contained in this Web Site or for any reliance placed by any person on the information. Cloudside Bed and Breakfast does not warrant that the functions or materials accessible from or contained in this Web Site will be uninterrupted or error free, that defects will be corrected or that this Web Site or the server that makes it available are virus or bug free or represent the full functionality, accuracy, reliability of the materials. If any of these Terms and Conditions (or any terms and conditions relating to a product or service referred to in this Web Site) should be determined to be illegal, invalid or otherwise unenforceable by reason of the laws of any state or country in which such terms and conditions are intended to be effective, then to the extent of such illegality, invalidity or unenforceability, and in relation to such state or country only, such terms or condition shall be deleted and severed from the rest of the relevant terms and conditions and the remaining terms and conditions shall survive, remain in full force and effect and continue to be binding and enforceable. Nothing in these terms and conditions shall exclude Cloudside Bed and Breakfast's liability for death or personal injury resulting from negligence of Cloudside Bed and Breakfast. All Intellectual Property Rights (including, without limitation, all database rights, rights in designs, rights in know-how, patents and rights in inventions (in all cases whether registered or unregistered and including all rights to apply for registration) and all other intellectual or industrial property rights in any jurisdiction) in any information, content, materials, data or processes contained in or to this Web Site belong to Cloudside Bed and Breakfast or its licensed source. All rights of Cloudside Bed and Breakfast in such Intellectual Property Rights are hereby reserved. Cloudside Bed and Breakfast makes no representation that any product or service referred to on or through the Web Site is appropriate for use, or available in other locations. The information and other materials contained in this Web Site may not satisfy the laws of any other country and those who choose to access this Site from other locations are responsible for compliance with local laws if and to the extent local laws are applicable. Certain (hypertext) links, advertisements or suppliers promotion will lead you to Web Sites that are not under the control of Cloudside Bed and Breakfast. When you activate any of these links, you will leave Cloudside Bed and Breakfast Web Site by opening a new window and we have no control over and will accept no responsibility or liability in respect of the material on any such other Web Site. By allowing links with third party Web Sites Cloudside Bed and Breakfast does not intend to solicit business or offer any security to any person in any country, directly or indirectly. Every effort will be made to carry out the contract but its due performance is subject to cancellation by Cloudside Bed and Breakfast or to such variation as we may find necessary as a result of inability to secure labour, materials or supplies or as a result of any act of God, War, Strike, Lockout or other labour dispute, Fire, Flood, Drought, Legislation, or other cause (whether of the foregoing class or not) beyond the sellers control. © 2019 Cloudside B&B, All Rights Reserved.